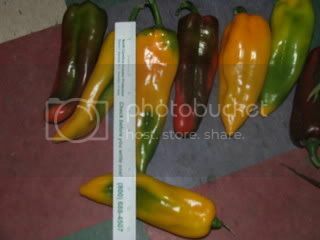 i have begun harvesting my new favorite all around variety of peppers. the Corno DI Toro or "horn of the bull. i grew the red variety last year for fun. The plant was almost 5 feet tall and yielded what were the huge super sweet peppers, almost candy like sweetness. 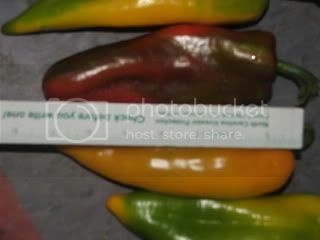 The largest pepper was over 9 inches long and 5 inches around. 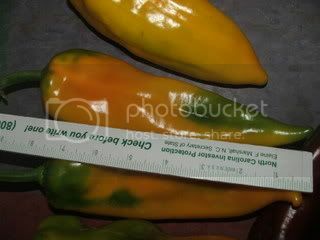 so this year i planted more...and added the yellow variety.. i set a ruler near the pictures for scale... yes that one is 8 inches long..
Todd you're obviously doing something right with those peppers because they are HUGE!!! Those are beautiful, where did you get the seed. I might try them next year. Good job there Jose!! I hope mine get that girth! How tall are your Corno di Toro plants this year? Is the yellow as flavorful as the red?? tomatogrowers.com eh!